As a few hundred years ago, we continue to appreciate and thank our family, friends and sometimes even strangers for all that they do for us. Remember how often you say thank you. Remember the reaction of people to whom you say it a wonderful word. Have you noticed that smile when you say thank you, and that the smiling one who addressed this word? Agree, it's nice to give thanks. After all, even a simple word brings joy to others. Sometimes, after some good work people offer money or other material goods, but more importantly and more pleasant to hear for a good deed simply thank you. And not just a "thank you" - subterfuge, but with meaning and sincerity. This wonderful opportunity is now Facebook provides us with a new service called Say thanks! What is Facebook Say Thanks? This is an opportunity to express their gratitude for family, loved ones, friends or even strangers with a short say thanks video. With the Facebook say thanks you do not need to know how to use complicated programs. All very simple. You can use the default theme choosing a friend to whom want to say thank you, or create your own creative video using one of the available themes. All you need is to add your favorite photo and choose a theme. Excellent video immediately ready and you can share it with your friends. How to say thank you on Facebook? To create a default say thanks video choose a friend and click "Share video". You can choose to whom will be available to view your video, be it private or available for all. You and your friend will receive a notification to view the video. In the default video using only primary picture of your friend. Much more interesting video you can create if you choose a theme and add pictures that best describe the great moments, amazing things or other memories of an unforgettable event. 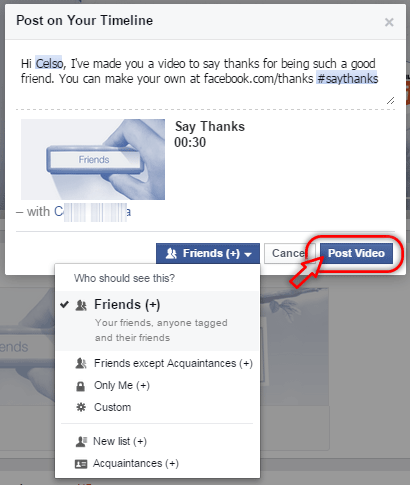 Your facebook say thanks video more important and more pleasant to receive if it created with meaning and sincerity. How to made Say Thanks video on Facebook with themes? Today there are three themes: this "Old Friends", "Friends" and "Family". Each theme has its own features. Theme "Old Friends" describes interesting wild ride, some amazing things, great moments and at the end of the video shows the memories on the wall with your photo within the frameworks. To choose this theme you must choose at least 5 photos (video duration 48 sec.) You can add a maximum of 15 photos (video duration 60 sec.). 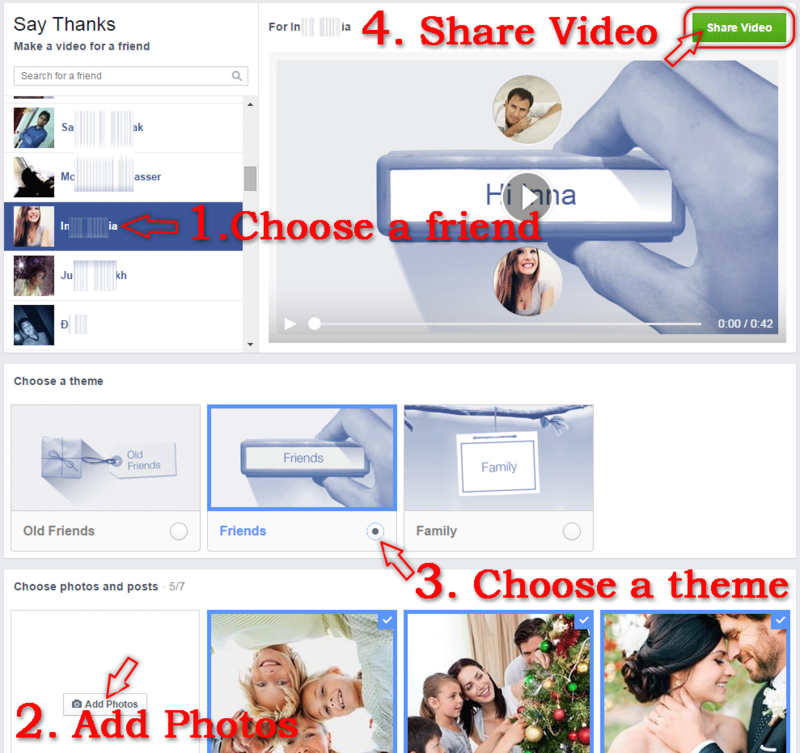 Note that the number of photo depends on the duration of your Facebook Say Thanks video. Carefully selected photos will make say thanks video more impressive and certainly will cause the smile and the joy of your friends. Video will by ready after choosing photo and theme. When you're ready to show your video to a friend, click "Share video". You and your friend will receive a notification to view it. 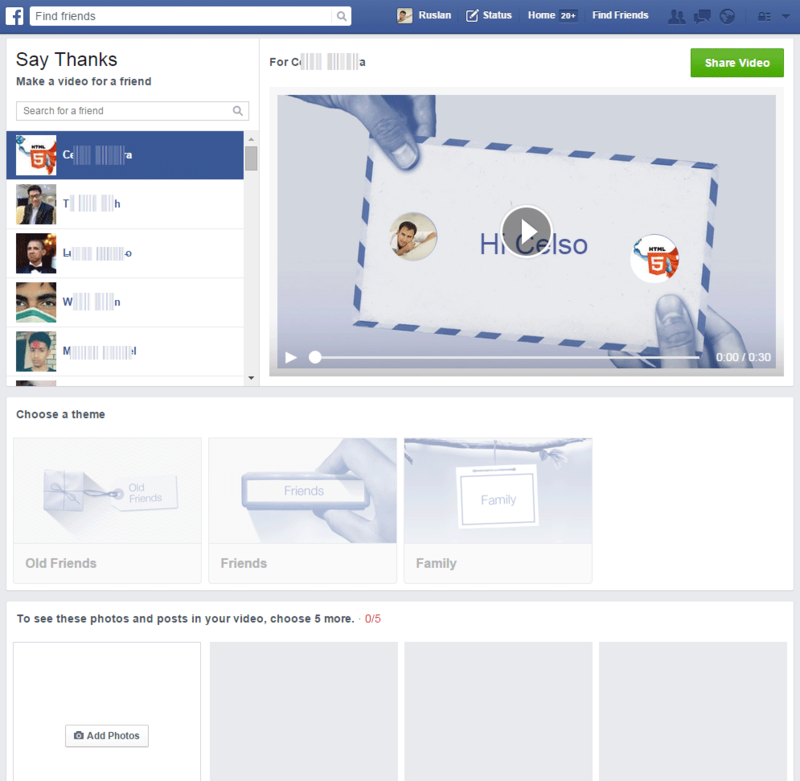 If you want to share your video on Facebook, choose who will be able to see it. Using the switch the audience choose with whom you want to share it and click "Post video". Remember that when you share Say Thanks video, the post will be able to see only those people who have been able to see photos and publication and that you include in the video. We several times a day talking to each other "thank you". The main thing is to always remember that to this true thanks belongs only one that carries only positive and comes from a pure heart! Therefore tell each other good kind words. Rejoice people close to you with their attention and care. Give each other not only gifts, but also words of gratitude, pleasant wishes and Facebook say thanks video. Now we also want to say for all thanks. Thank you for your precious time and attention for reading this article.